Do you love someone that loves a good time? 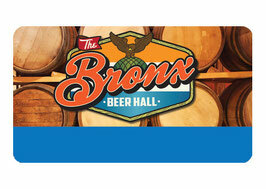 The Bronx Beer Hall Gift Card is the perfect gift! With our gift card, your loved one will access to everything The Bronx Beer Hall offer...right up until the card runs out of money. Then it's just a beautiful plastic keepsake.